UDM Downloads > MS Word Recovery Tool! Recover Data for MS Word file recovery software is an advance and powerful word file repair software to quickly repair word document and restore word file in safest location. Corrupt or damaged MS Word files is now easily and perfectly recover by Recover Data for MS Word document recovery tool. Recover Data for Word file repair tool is one of the best fix word file software to fix word documents and restore all meta data from corrupt Microsoft Word documents files which gets corrupted. Software fully supported to recover docx files. 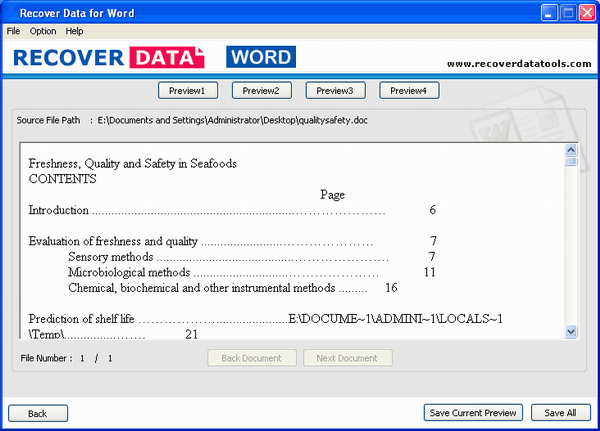 Best Word recovery utility and Word Reader software can effectively reads (scans) corrupt word documents files and extract whole ms word data (table, bulleted lists, embedded images, word art, field objects, hyperlinks, headers-footnotes, charts, clip arts etc) and save into a new word (.doc or .docx) files. Features for Word Recovery Program: * Word Recovery program to repair corrupt word files. * Word Recovery Tool recovers text, formatting, table, bulleted lists, embedded images, charts, drawings, and so on. * Software supports Recovered Document Preview. * Easily recover docx file. * Supports saving of repaired document in RTF (rich text format), HTML, Text. * Supports Microsoft Word 95/97/2000/XP/2003/2007. * Easy user interface.